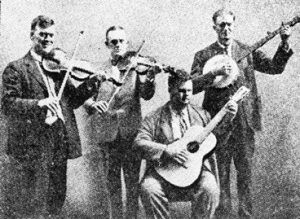 The Skillet Lickers’ name is synonymous with string band music in Georgia. This band from Dacula is familar to Georgia historians and folk music fans across the world. Their recordings have sold millions and their style remains influential to the development of the country, folk, and bluegrass music. 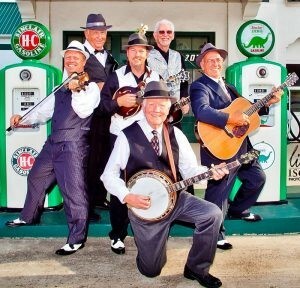 Today’s Skillet Lickers are carrying on a tradition of string band music going back four generations. The original Skillet Lickers (L to R: Gid Tanner, Clayton McMichen, Riley Puckett, Fate Norris), circa 1920’s. It all started in 1926 when Columbia Records artist and repertoire talent scout, Frank Walker, took a trip south from New York City to put together an all-star cast of north Georgia musicians and dubbed them “The Skillet Lickers.” Gid Tanner, Riley Puckett, Clayton McMichen and Fate Norris were already considered regional celebrities from their popularity at the Atlanta Fiddlers’ Convention and other live shows and events. They proved to be one of Columbia’s most successful groups from this new “hillbilly” brand of music. 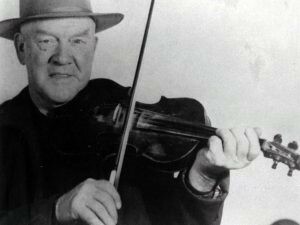 Gordon Tanner, son of Gid and fiddler extraordinare (1917-1982). Other musicians would eventually join the group and record alongside the Skillet Lickers. People like Lowe Stokes, who was the inspiration for the Charlie Daniels Band classic, The Devil Went Down to Georgia, and Burt Lanem, who was Clayton McMichen’s brother in law, were later additions to the band. Gordon Tanner, who was Gid’s son, recorded on the Skillet Lickers biggest selling disc, Down Yonder, for RCA’s Bluebird label at the age of just 17. The legendary Gid Tanner (1885-1960). Gid was the group’s leader. Many agree that he wasn’t the best musician or singer of the group, but he was certainly the showman of the group. As time moved by and early members of the group scattered and settled in different parts of the country, Gid kept his home in the small town of Dacula. His son Gordon continued to play music as he raised a family in Dacula as his father had done. Gordon’s son, Phil, took to music and to this day, still makes a home in Dacula. Now Phil’s son, Russ, has also picked up the music and the Skillet Licker name that started three generations earlier. Record labels and big recording contracts are no longer in the cards for today’s Skillet Lickers. They are still going after 90 years, but continuing the tradition of the original group: telling a story, entertaining people, and having fun doing it. 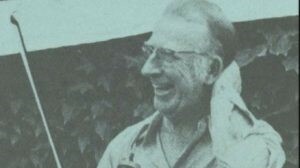 After Gid’s passing in 1960, his son Gordon would pick up local musicians and retain the name, The Skillet Lickers, upholding the historic band’s namesake. The current lineup of the Skillet Lickers includes Phil and Russ Tanner along with Fleet Stanley, Joel Aderhold, Brian Stephens and Larry Nash. The current musicians have a different perspective on the music than the original members had in the 1920s. 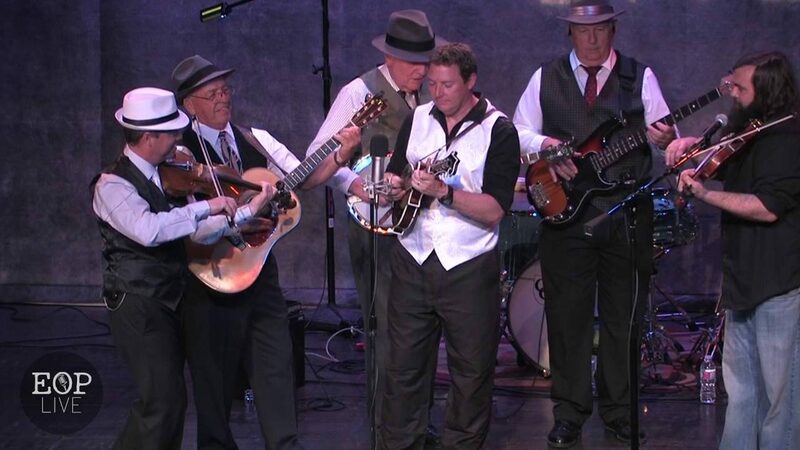 In addition to concerts at local festivals, fairs, and music venues, the Skillet Lickers have also recently written and currently perform two different theater shows at area theaters, educating thousands on the history and legacy of the Skillet Lickers, while entertaining them with Skillet Licker classics. One production tells the story of The Skillet Lickers and their role in the development of the recording side of the country music industry. The other show tells of the history of radio and its development in America, specifically as it relates to the Skillet Lickers and roots music. LEARN MORE: Click here to read more about today’s band members and click here to check out an interactive timeline of the Skillet Lickers’ rich history.